JERUSALEM (AP) — Israeli archaeologists have discovered a 2,700-year-old seal that bears the inscription “Bethlehem,” the Israel Antiquities Authority announced Wednesday, in what experts believe to be the oldest artifact with the name of Jesus' traditional birthplace. 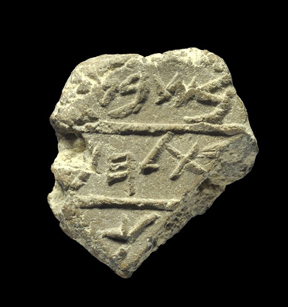 The tiny clay seal’s existence and age provide vivid evidence that Bethlehem was not just the name of a fabled biblical town but also a bustling place of trade linked to the nearby city of Jerusalem, archaeologists said. The stamp, also known as “fiscal bulla,” was likely used to seal an administrative tax document, sent from Bethlehem to Jerusalem, the seat of Jewish power at the time. It was found as archaeologists sifted through mounds of dirt they had dug up in an excavation outside Jerusalem’s Old City walls.